The Rocktron R50C | Gear Acquisition Syndrome!! … our hair was sometimes larger than life. It was a glorious heyday for Pop-Metal mania. There were more shred-filled, hard-rock machismo songs on the radio then than any other time. A hard-rockin’, street-brawlin’, timber-fallin’ amp! At the time, I had all four. Since then, my clothes and hair have tamed down a bit, and my wife is very glad of this fact. But have my guitars and amps??? HECK, no! Hence… my R50C – the amp that puts a little STORM in my studio! It’s no mistake that rockers like the Stones, Van Halen, AC/DC… heck, even Night Ranger, are still out touring on the road decades later. There’s just something about playing a guitar through an amp REEEEEEEALLY LOOOOOOOOUD that keeps ya young somehow. I can’t explain it. But, oh… do I know it’s true!! The R50C came out in the early 2000s, and it retailed for around $299 in its day. It was an entry-level, modern-sounding solid-state amp that made a lot of headbangers smile, and still does. The moniker “Rampage” I would heartily agree with – this amp is not subtle. Plug your axe into this chainsaw tone grinder and let the audience beware! 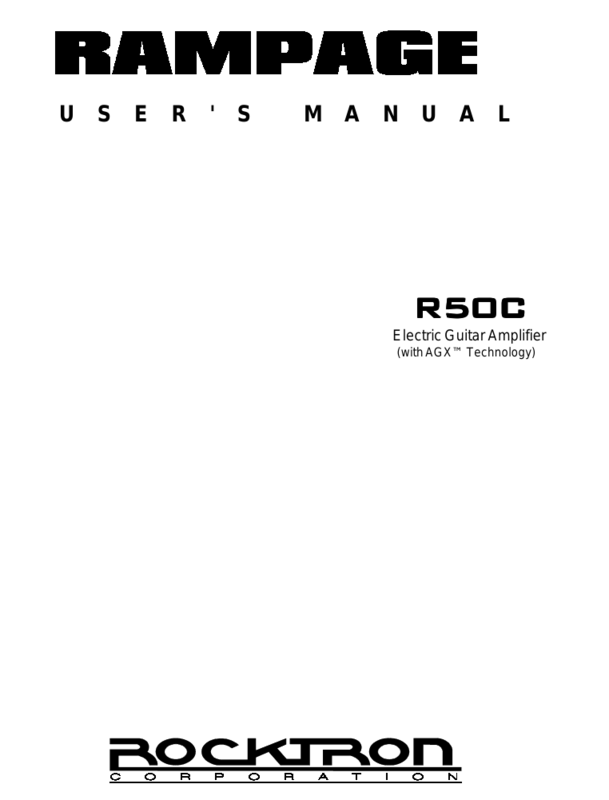 The R50C Manual you can DOWNLOAD HERE, for those wanting deeper insight into this brawny buzz-grinder. 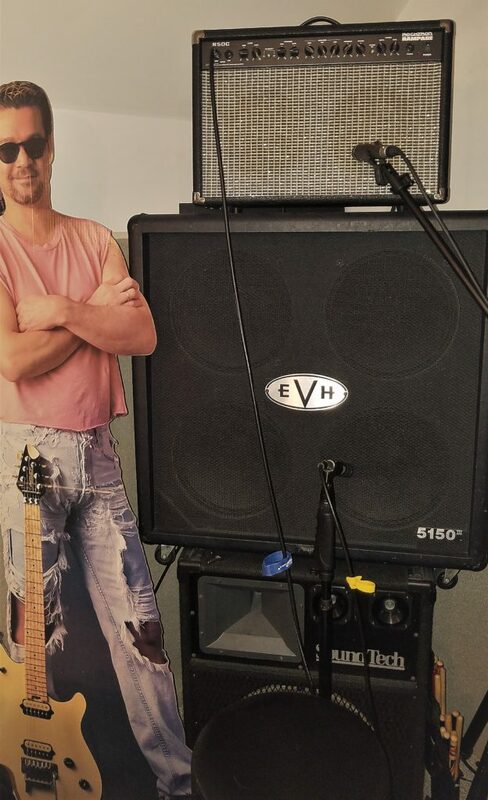 I keep the R50C in my main rehearsal room, plugged into, and sitting high atop, my EVH 4×12 cabinet. I like it standing at the ready there so that, at any moment, either for personal or band rehearsal, I can just throw on one of my guitars nearby, throw the switch, and GO. It makes for a great rehearsal amp since it’s easy to use, without a lot of extraneous bells & whistles. The tone is a bit modern-sounding though, so if you prefer a more “70s rock” tone, you might want to go instead with a classic Fender or Vox option. Also, remember that this IS a Solid State amp. There’s no tubes in this baby, so you’re not going to get a tube amp sound out of it. As is usual for these types of amps, it has a tendency to compress what you play and lessen the overall dynamic effect that some styles of playing demand. Some say they think this amp doesn’t translate fast notes very well. I think they’re just hearing the Solid State sound, frankly. There’s definitely a difference. I’m still more of a tube amp guy myself, but every once in a while, this amp’s sound is just the ticket. Not to mention that the Rampage provides a really good CLEAN tone. If you like to use delays or chorus on a clean channel, you’ll get great, clean results with this amp. The stereo Chorus gives an almost “surround sound” kind of feel when engaged, and, though it only has two controls, spits out great results that you’ll wanna play with for hours. Go ahead – throw all your favorite “Edge” licks at it – the Rampage can handle ’em! If you prefer your sensory pleasures in the form of high-gain, hot lick, distortion overload you’ll be a fan of the R50C for sure. It was built with hard rockers like you in mind. To get the most dB out of your performance, make sure you’re plugged into the “High” input gain port. It adds about 3 dB more gain to your signal (I measured it) and your burning need for edge and speed shall be appeased! The picture on right shows how I like to have the EQ set. Tone is always subjective, but I find these settings to give me a tone that I could record with. Keep in mind that these settings give me what I consider a good tone coming out of not only the amp, but also the cabinet. The two sound very different, and, since there’s no way to defeat the onboard speakers, you’ll get BOTH emitting signal when the R50C is linked to an external speaker cab. Though I’d much prefer to be able to shut off the onboard speakers when I want to, in the studio I very much prefer to have both the amp AND the external cab shouting at me. They sound so different that, if I mic up both, I get two contrasting timbres to record onto two seperate tracks while only playing once. Yet another reason why linking an external cab with this unit is the best way to bring out its best. I tend to have the Presence knob dialed quite high, at about 2 o’clock, as it gives the notes I play more definition and clarity. Give Me a Cabinet, Dab’n it! If there’s a weak spot on this amp, most agree that it’s the speakers. The two onboard 8″ speakers Rocktron provided do the job, but “adequate” is about the most you can say about ’em for live performance. They’re a little too small and frail compared to the impressive high-gain turbulence that this amp can generate via its electronics. I guess we couldn’t expect Rocktron to be able to make everything awesome at the low, low price point that this amp fit into. Something had to give. Most agree it’s the speaker. What the shortcoming is in the speaker design, who knows? What is clear is that it sounds a little thin and brittle for live work. In the studio, however, I actually like the sound that the onboard speakers dish out. Since so often I’m having to put high-pass filters on electric guitars for the final mix, with the Rampage I don’t have to. IF I only use the amp. 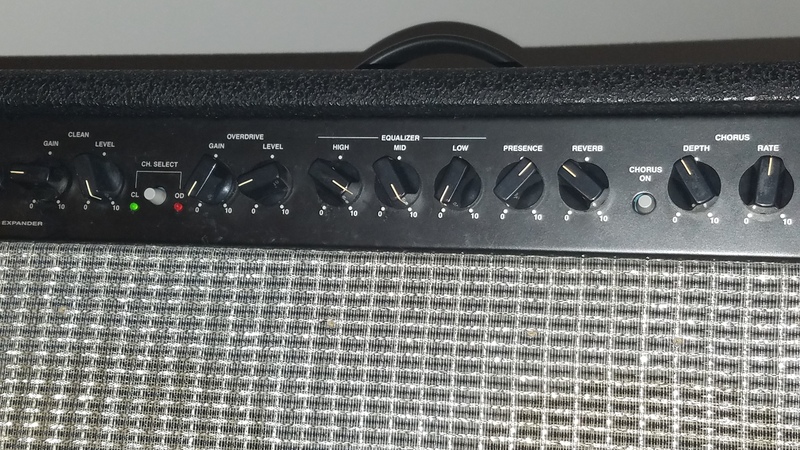 But I tend to use an even better option – connect an additional cabinet to the amp!! As usual too, the better the cabinet, the better the tone. If you have a really amazing cabinet, like the EVH 4×12, or 2×12, both of which I use, you’ll want to just sit in front of it playing the whole day long, mesmerized by the intimidating tone, and swallowed up in the mind-bending metal magic stampeding out of this device. In fact, you may just become a metal-head studio recluse, never using your door again. We’ll understand. We’ll take turns popping some TV dinners through your window every once in a while, and curiously listen to your Yngwie licks as they try to burrow their way out into the sun… ! Stu – Stu – Studio. Whoa – oh. In my control room I have, like most of you, a whole slew of amps at my disposal that reside on my hard drive. Amazing, isn’t it, how these days we can have really convincing amp simulations with just the click of the mouse? 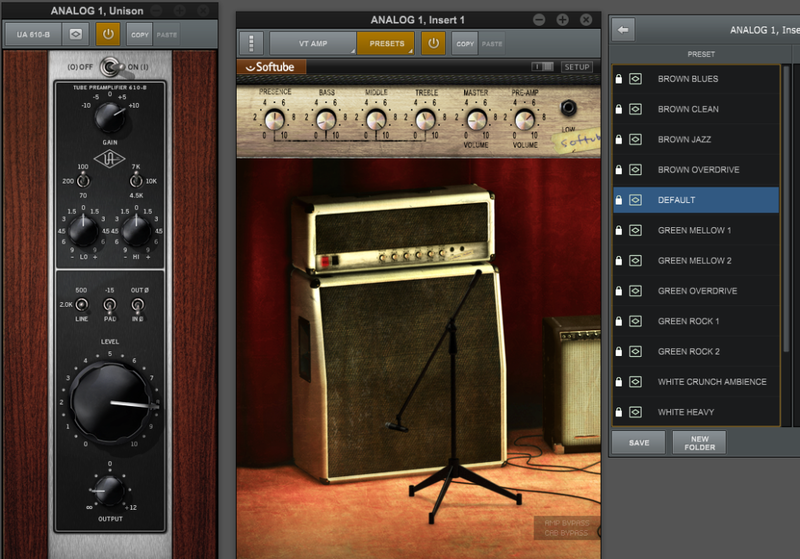 I use the UAD options, as well as AmpliTube. But I also have a few hardware options, kept plugged in and ready. I keep these to the left of my console, so if I want “the real deal” I can just roll my chair over to whatever head I need, plug in and tell Pro Tools what input it’s using. Boom – I’m enveloped in the power! This Rocktron amp is one of my options, though honestly I have yet to use it on any of my recordings up to this point. 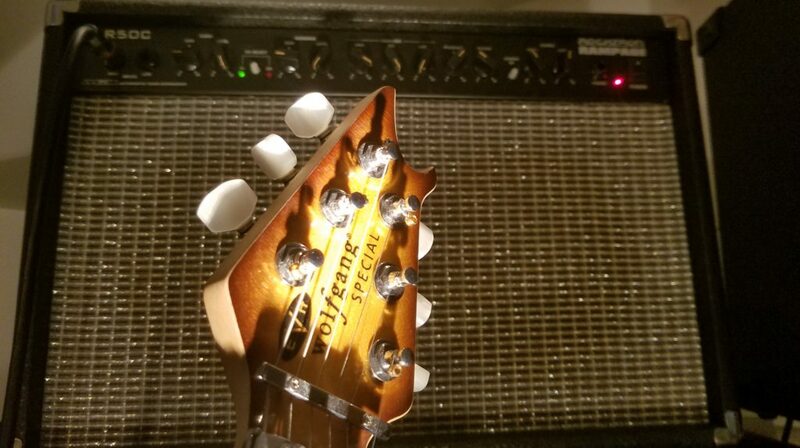 The reason really has nothing to do with the amp, but rather with my song selections – I typically am not writing or recording metal or hard-rock tunes. If I ever DO, however, or if I have a client come in where I’m producing their album and it’s spilling over the edge of heavy, then I would without hesitation mic up the R50C through my 4×12, knowing that said client would be drooling over the ponderous, stomping tonal beast that I just unleashed upon their unwitting ears. As always, it’s horses for courses. TheR50C is not a super-versatile amp, but if you like to kick the can down Headbang Avenue, you might not find a better companion at this price point! Shred Up Your Necks With AGX! 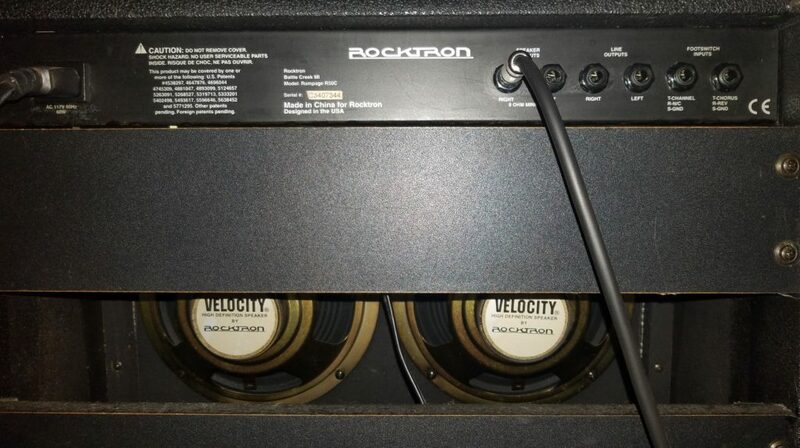 This Rocktron amp, like many others in their line, includes their patented AGX technology. The acronym stands for “Automatic Gain Expander“, and it’s there to solve the long-standing problem of noise that guitar players experience when turning up that high-gain distortion. It’s not perfect though. To me, I don’t really hear that much of a difference from any of my other amps, and since there’s no controls for this AGX circuit… I guess we’ll just have to take their word for it that it’s actually doing something beyond what other amps provide. If I turn the volume on my guitar all the down, I still get noise. Don’t know the electronics reason for that, but it definitely is there. It’s no worse than any other amp I have, but I’m not hearing considerably better either. So, I don’t know… If I were playing live with this amp I would probably still use the dead-stop Gate on my effects unit, since it allows me to adjust the threshold and get rid of 100 percent of noise based on the signal level I choose. Ymmv. Recordings, Fresh Outta the Pro Tools Oven! To give you a real sense of what this amp can deliver, I’ve recorded two different sound snippets for you. For both of ’em, I played my EVH Wolfgang guitar, which, if you like, you can read about in THIS ARTICLE. 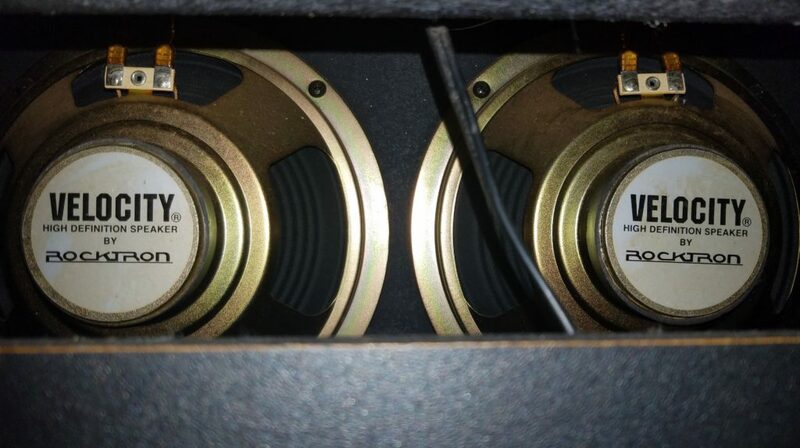 Also, I used for both an SM57 mic on the EVH 4×12 cabinet AND the R50C 8″ speakers. The cables then went into my Apollo Twin interface and straight into Pro Tools. To keep things clear and honest, I used no effects and no compression software whatsoever. I used the same amp settings which I mentioned above, since that sound to me is balanced perfectly and sits in the live mix really well when playing with bass and drums. For the second snippet, I switched to the OVERDRIVE CHANNEL, and put my Wolfie fully on the Bridge pickup. I didn’t change any of the amp settings at all, so you could hear what simply switching from one channel to the other will give you. Finally, as you listen, the EVH CABINET is panned to the RIGHT side. The R50C signal is panned to the LEFT side. You can listen to them both for a stereo effect, or cancel one side to hear better what each one sounds like alone. So whaddya think?? Did you like the sound? Think the Rampage has got the tone you’re looking for?? Wanna dial in your favorite setting and start buzzing?! I don’t blame you! Turn Up Ye Amp, Ye Scurvy Dawwwg… ! This amp is fun. 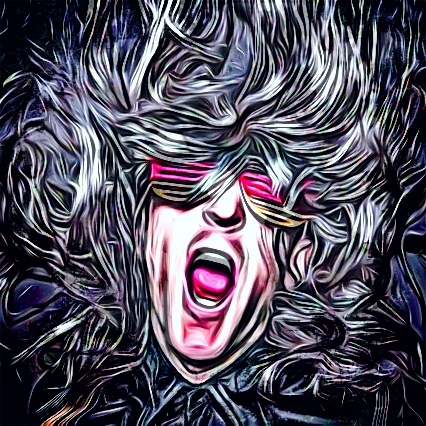 In prepping for this article I spent some hours just riffing and coming up with new songs and resurrecting old ones that call for a more beefy, in-your-face kind of tone. The Rampage didn’t let me down, and once I got going, I didn’t want to stop. 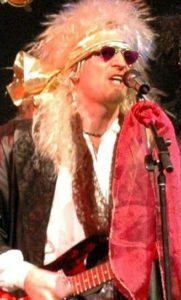 If you can’t go a day without listening to or playing Grindcore, Heavy Metal, Nu Metal, Thrash Metal, Death Metal, Groove Metal, Black Metal, Glam Metal or even Pirate Metal (“Arrrrh, Matie! !”) then you need to plug your guitar into the Rocktron R50C and inject some palm-muting, fast-licktion fun into your day. Make sure you’re hooked up to a good cabinet to get the best sound, and you’ll probably find yourself hours later, shaking your head in wonder at where the time went. After all, time flies when you’re shredding fun. Now go… make… (loud) sounds! !